Order the Belladonna Maxi Dress from HolyClothing, in size S - 5X in nine colors. The beautiful Belladonna Maxi dress could be from a fairy tale, and it is super comfortable, too. The bodice has a lace-up front with embrodered satin inlays, lace ribbons and elastics in back. 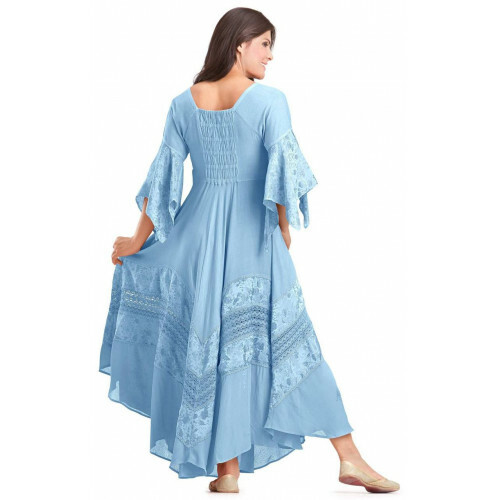 The lovely flowing wide skirt has inlays made of embroidered satin and chiffon, and it has an asymmetrical hemline; this dress is longer in front and back, than in the sides. Belladonna Maxi has 3/4 long sleeves. The Belladonna Maxi dress is made of viscose, a natural fabric made of wood fibres. The Belladonna Maxi dress is made in size S - 5X and in nine colors. Click here to order the Belladonna Maxi dress from HolyClothing. Add code unicorn15 at checkout to receive a 15% discount on your order. Garment measurements table in cm for the Belladonna Maxi dress (latest update April 2019).